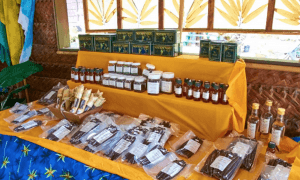 This post shares what we learned about vanilla farming in French Polynesian and at the bottom has delicious recipes for cooking fish with vanilla sauces. Vanilla has been one of my favorite scents ever since my mom let me add the vanilla extract to her baking. I couldn’t get enough of that luscious aromatic fragrance coming from the small brown glass bottle! 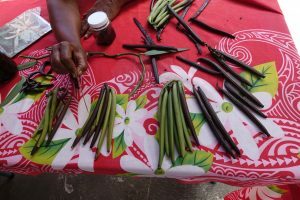 After spending time with a vanilla farmer in Taha’a French Polynesia this summer, I realized how lucky I was years ago to be smelling “the real thing” – genuine vanilla extract, the only flavor that is regulated by US law. Imitation or artificial vanilla extract is the norm in the world these days, a loss to us all. “Imitation” vanilla extract is made with synthetic vanillin. Over the last century, fossil fuels, cinnamon, paper waste, pine bark, and even cow manure has been used to make imitation vanilla extract. Now, at least in the USA, cancer-causing coal tar is not as widely used as it once was to make artificial vanilla. but it’s still in many vanilla-flavored foods from Mexico, so buyer beware! Vanilla has been popular for centuries. The Aztecs used vanilla to flavor their chocolate drinks and Spanish conquistadors brought vanilla back to their patrons in Europe. The vast majority of the world’s vanilla is grown in just a few places, Madagascar, Mexico and Taha’a, French Polynesia being the main ones. “Tahitian” or French Polynesia vanilla has its own unique flavor, some say more fruity than other vanillas. Madagascar is the most commonly known vanilla fragrance. 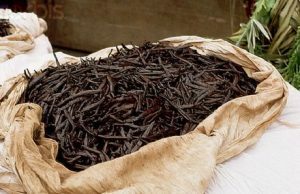 Mexican vanilla has a woody or spicy taste. Taha’a is nicknamed the “Vanilla Island” because it produces 80% of all French Polynesia’s vanilla. 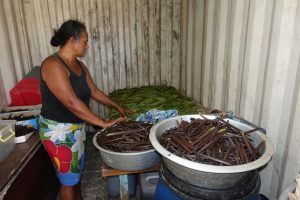 Vanilla arrived in Taha’a around 1919 and some of the world’s finest beans are grown here, most organically and without the labor-saving devices or methods. We’d heard that the whole island is scented with vanilla, which was enough to draw us there when we sailed through the Society Islands. Harvesting Vanilla the Old-Fashioned but Difficult Way. Taha’a is a quiet island accessible only by boat (the closest airport is on the nearby island of Raiatea). 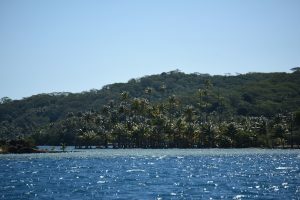 We anchored Golden Glow in a beautiful bay near Point Teruapatiri in front of a well-known vanilla farm called “La Vallée de la Vanille,” the valley of vanilla. 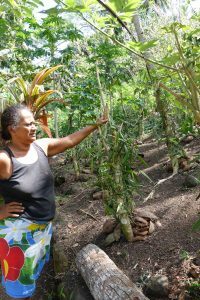 The owners of the farm, a Polynesian woman named Morita Hioe and her Danish husband Brian Hanson, continue her family’s hundred year tradition of growing vanilla on this property. As we talked with Morita about her business, she shared how difficult small family vanilla farming is, especially because she uses only natural methods. She grows her plants out of doors rather than in the greenhouses most big vanilla farms use. Farming in the open air requires more work for a lower yield, whereas in greenhouses the higher humidity rate helps get better yields. Greenhouses use concrete poles which are easier than tending plants growing on the trunk of a tree. 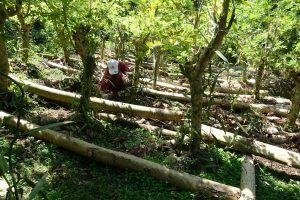 Morita also never uses chemicals or unnatural methods to hasten growth or to process her vanilla once the pods are picked from the vines. Morita lamented that the younger generations in her own family don’t want to work as hard as the traditional farming methods require. Her brother was there helping her on the farm, but there were no children or grandchildren helpers to be seen. The vanilla plant is a climbing vine with rubbery leaves and an orchid-like flower. Vanilla comes from the seedpods set after the flowering of the vine. That’s how vanilla got it’s name, which means “little pod” in Spanish. The hardest part is getting the flower to bear fruit. The vanilla flower lasts only one day, which means the plants have to be inspected daily for open flowers. A bee found in Mexico (where the plant originates) is the only insect that will pollinate the vanilla vine. So in French Polynesia, each flower has to be pollinated by hand. It’s no surprise that vanilla is the second most expensive spice in the world after saffron. But when you browse through the products La Vallée de la Vanille offers in its open-air shop, you know it’s worth it. Plump vanilla beans, vanilla coffee, lotions, body oils, baking powder, extracts, etc. The spray-on vanilla oil is lovely after a shower, and I keep some of their floral soaps in our cabin which makes it smell like garden flowers. Vanilla pods have an oily, black pulp inside containing many small flavorful seeds. Pods are picked with they are still green and contain a compound called glucovanillin. The pods are air-dried to cure them over three to four weeks until they have shrunk and turned black. 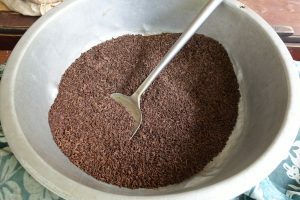 To make vanilla extract, the beans are ground into tiny pieces which are then percolated with water and alcohol and distilled into the extract. In cooking one pod is equal to about three teaspoons vanilla extract. Authentic vanilla powder is brown not white, which is artificial or has been bleached. Brown definitely tastes the best. Then, for 1–2 weeks, the pods are alternately sunned and sweated: during the day, they are laid out in the sun, and each night, wrapped in cloth and packed in airtight boxes to sweat. During this process, the pods become dark brown, and enzymes in the pods release vanillin. Finally, the pods are dried and further aged for several months, during which time their flavors further develop. 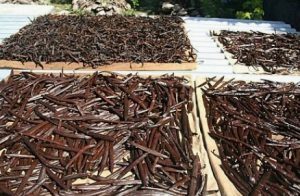 Morita does not rush this curing process as some mass producers of vanilla do. They must wait for nine months or more for the beans to grow and mature before they can be harvested. Again, we do not employ unnatural techniques to hasten the drying, so after this if there is ample sun, the beans will be fully dried within three months. It could take longer if there is more rain. Before our time in French Polynesia, I had only used vanilla in cooking sweet dishes. What I discovered here is how delicious it is served with fish, which we learned dining at the the Fare Yacht Club in Huahine. Since we’ve been catching Mahi Mahi throughout the South Pacific that was the fish we used, but all deep water fish with firm flesh works well, either pan-fried or grilled. 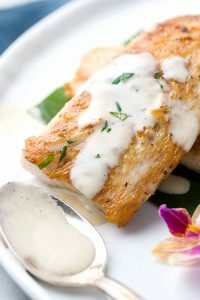 These recipes combine local ingredients most common in the Society Islands like vanilla beans, coconut, rum, coconut and fresh fish to make simple yet elegant meals. They’re delicious so give them a try! In a pan, lightly fry the fish fillets in butter until golden brown. Lightly sauté the shallots in the pan with butter. Add two teaspoons of vanilla extract. Slowly mix in the cream, scrape the vanilla bean pod and add it to the sauce. Season with salt and pepper to taste. In a large pan, heat the olive oil over medium heat. Sear the fish over high heat then immediately lower heat to medium and sauté the fish gently until golden on each side, 3-4 minutes. Remove the fish from the pan and cover it with foil to keep it warm. In the same pan, lightly sauté shallots for 1 minute, and add a little more olive oil if they get too dry. Add the vanilla extract, chicken stock and wine. Stir together. Slowly mix in cream, salt and pepper. Cook for a few minutes until the sauce is reduced by about half. 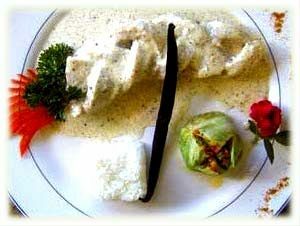 Return the fish to the pan, coat with the cream sauce, and cook for 2 minutes, then serve over rice or alongside mashed potatoes. I took those pods and made vanilla extract for Christmas gifts last year. I still had a couple bottles and wondered what I should do, and this post answered that question…I should use them!